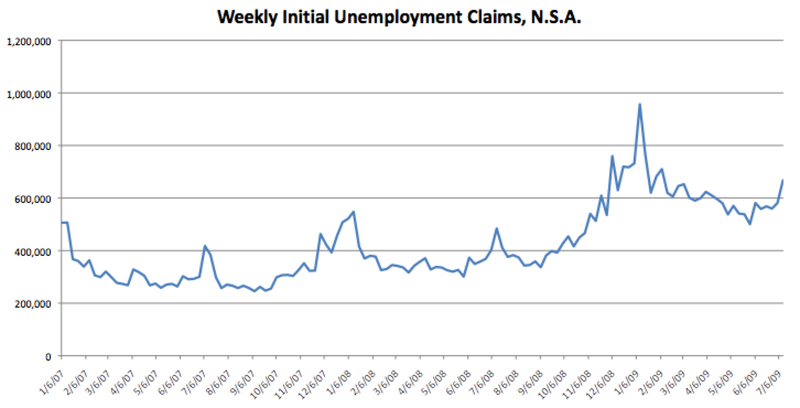 The graph shows the Weekly Initial Unemployment Claims, Non-seasonally adjusted, from the Department of Labor. Claims have remained elevated since the market panic last fall. There was a “green shoots” trend up until June, but in fact claims are now trending up again in July 2009. Similar brief surges are notable in the data for July 2007 and July 2008, so there may be some basis for believing that the current surge is only a seasonal transient. But these are not normal economic times, and the seasonal adjustment process is correspondingly less useful. The reader is encouraged to judge for him- or herself the significance of the current numbers.